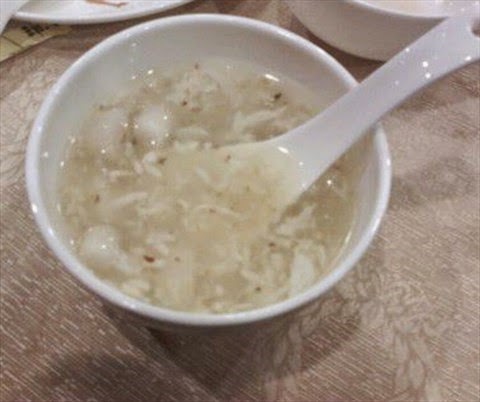 Not only Zhailai and Penglai, the more expensive glutinous rice (糯米) can also be fermented to produce different grades of wine. 酒釀JiuNiang, in a separate category, is from limited fermentation with 1-2% alcohol, in other words, alcohol-flavored rice. This is a popular winter-time snack, either by itself or served with beaten eggs and/or dumplings. Prolonged fermentation does increase its alcohol content; although for true wine-making, it must be done in a winery. HongLu紅露酒-making starts with already-made, raw glutinous rice wine, to which red koji (紅麴) is added for a second fermentation. The final alcohol content is between 14.5 to 22 proof, in between hard liquor and beer, a viable niche. 紅露酒 can trace its origin to Hokkien 紅老酒 that went into industrial scale production in Taipei in the 1910s before the state monopoly took over. After the war, it was out-competed by the always-in-demand Rice Wine and the post-war newcomer Saohsing Wine (紹興酒, see below), and faded away quickly after 1987. It regained some popularity in 2004, through the efforts of folks in Yilan where it was once privately made. By and large, the Taiwanese were unfamiliar with Saohsing Wine which originated in Saohsing area in ZeJiang, China, and it had quite a number of variations with 13-15% alcohol. The R&D of Taiwan Saohsing actually started in 1949, ordered by the then recently arrived new regime, in Puli Winery (埔里酒廠, established in 1917, nationalized by the Japanese Colonial Gov't in 1922, and again by the ROC in 1945). A small quantity went on market in 1953. This wine was a favorite of Chiang Kai-Shek whose hometown was near Saohsing. 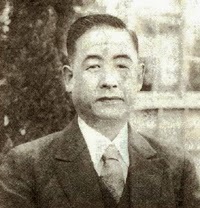 Each year, immediately before his birthday, an exclusive collection called 介壽酒 ("long life to Kai") would be prepared under watchful eyes before sending to the Presidential Palace for Chiang's very public birthday celebration; although no common folks ever had the privilege of having even a sip. Ironically, 介壽酒 is now mass-produced to satisfy the demand of visitors from Communist China. The quality of Saohsing was much improved in 1955 when those refugees evacuated from DaChen (大陳) well-versed in Saohsing-making were invited to participate in its production. As a result, this wine became the bestseller in Taiwan. The quality was further improved in 1965 by using 5-year old stock as the base for more blending, and the wine became the mainstay served at national banquets, official functions, and of course private celebratory parties. Lesser quality Saohsing is also used in cooking. The most popular is the chilled appetizer, drunken chicken (醉雞). Puli Winery was devastated in the September 21, 1999 earthquake. The near total loss of aged stock was a huge blow. The Winery, however, bounced back in 2003 when its surviving 10-year-old cellar stock (十年窖藏精釀陳紹) was made available to the public. The Winery is now very popular with casual tourists and wine connoisseurs alike. Its campus has been re-built complete with a very informative museum and numerous food stalls in the front yard (grilled koji sausage is a must-try). Taiwan, being the land of rice riches since even before the Qing era, rice wine [米酒MiJiu] was a natural byproduct. In fact, many old Taiwanese customs steeped deeply in this home brew. For example, to stimulate hair growth of a new-born, ginger slices dipped in rice wine were used to rub the baby's scalp. During the Dragon Boat Festival端午節, the character "王" was written on a child's forehead - to ward off evil spirits - with 雄黃 (realgar) dissolved in rice wine. After giving birth, rice wine not only was a cleanser for the mother's body but also for preparing chicken soup rich in blood-regenerating components, especially 當歸 (danggui, Angelica's root). And a cup of rice wine was always offered to guests arriving from China as a gesture of welcome. The old way was no more complicated than introducing 酒麯 (wine koji) into steam-cooked Zhailai rice - known therefore as the Zhailai method, and hoped for the best. Sometimes when things went wrong, then instead of wine, vinegar was the product. The famed Red-label Taiwan Rice Wine starts out with Penglai Brown Rice (蓬萊糙米), through fermentation, then the crucial step of distillation to obtain up to 11% alcohol (v/v). 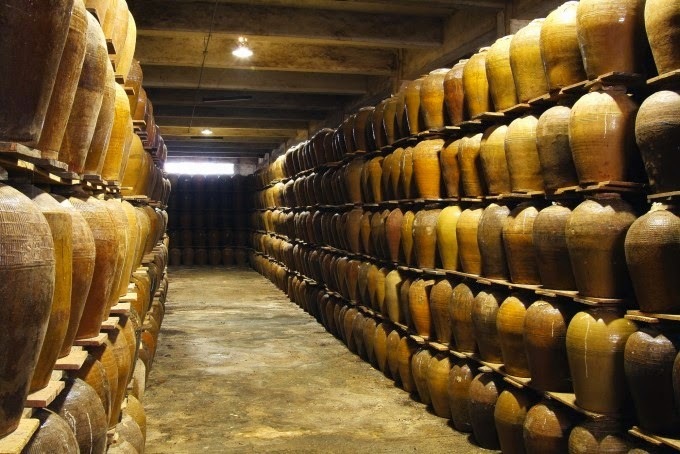 Before the taxation of alcohol beverages started during the early Japanese colonial rule (of which 60% were rice wine), there were around 1,000 wine makers of various sizes. This number dwindled to 200 after taxation. And in 1922, the national tobacco and alcohol monopoly act went into effect thus ending the private enterprise era. In 1927, a new way of making rice wine, the Amylo method, was borrowed from a factory located on the outskirts of Saigon and widely applied for mass production back in Taiwan in 1931. The Amylo method entails the following: First, mix rice, water and hydrochloric acid, and cook the mixture under high temperature and high pressure until liquefaction. After cooling, add Rhizopus delemar to break down the polysaccharides (i.e., starch) and Saccharomyces (yeast) to produce alcohol, both done at 36C. The fermentation takes only 8-9 days. Initially, there were Rice Wine Nos 1 to 3 with increasing alcohol content. 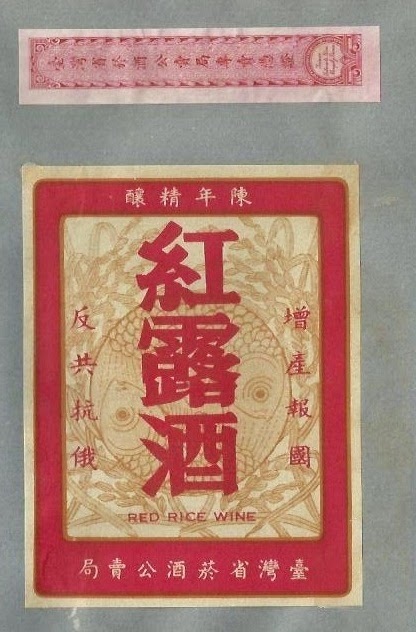 The 20.5 proof No 2 was re-named 赤標米酒 which became the predecessor of the post-war Red-label Taiwan Rice Wine (see bottle label above). Blending remains a secret; although the formula appears to be [raw rice wine]:[molasses alcohol] = 6:4. At one point in the mid 1940s, the ratio was changed to 4:6 owing to a war time and post-war rice shortage. 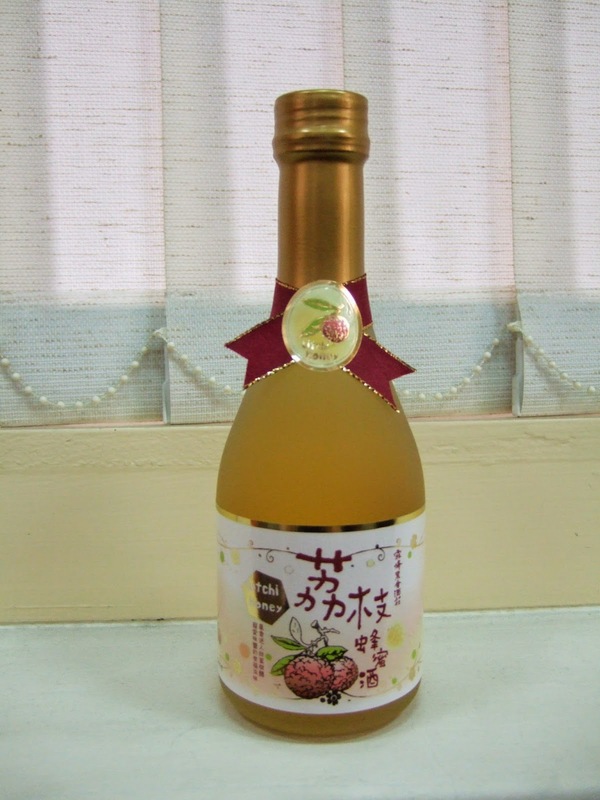 Increasing the molasses alcohol content further, through blending, then it became 太白酒 (Taibai wine, below), the least expensive, hence very popular rice wine in Taiwan. The slogans in red were typically seen in the 1950s. The tobacco and alcohol monopoly law continued after 1945, until abolished in 1987 when Taiwan joined the WTO. The National T&A Bureau 菸酒公賣局 has lost its market share since: Tobacco products are down to less than 30% share and the most popular Taiwan Beer, to less than 70% (2014 data). With the increasing prosperity and changing tastes, 80% of Taiwan Rice Wine are now used, somewhat wastefully, as cooking wine. And 太白酒 and many other Taiwan monopoly brands are long gone. Saké made in Taiwan? You bet. World-class, too, no less. We will now take you on a journey to Wu Feng (霧峰), Taichung, where it all began. First the background. 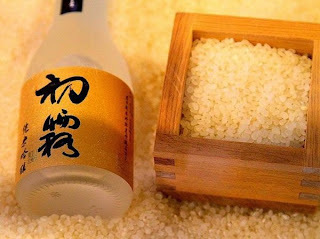 To make saké, a consistent supply of high-quality wine-rice must be available. The recent development of YiChuan Fragrant Rice (益全香米 or 台農71號) fits the bill perfectly. This strain was bred from the Japanese Kinu-hikari (絹光) strain and a Taiwanese native 農稉 No 4 (a legacy of the Penglai rice) that finally entered the official registry in Year 2000, after 9 years of exhaustive testing. The name YiChuan is in honor/memory of Kuo Yi-Chuan PhD (1946-2000), the project leader. According to Mr Huang Ching-Chien黃景建, General Manager of Wu Feng Farmers' Association (霧峰農會), in 2002, this new strain of rice went into wide cultivation locally; its high quality has proved an instant hit. And a decision was made to try and use YiChuan rice produced from all 250 hectares of fields in Wu Feng to make Taiwan saké. A consultant, 廣井忠夫Hiroi Tadao PhD of Tohoku University in Sendai was appointed and engineers/technicians from Taiwan dispatched to Niigata Prefecture, the saké country, to learn the art and science of saké-making. 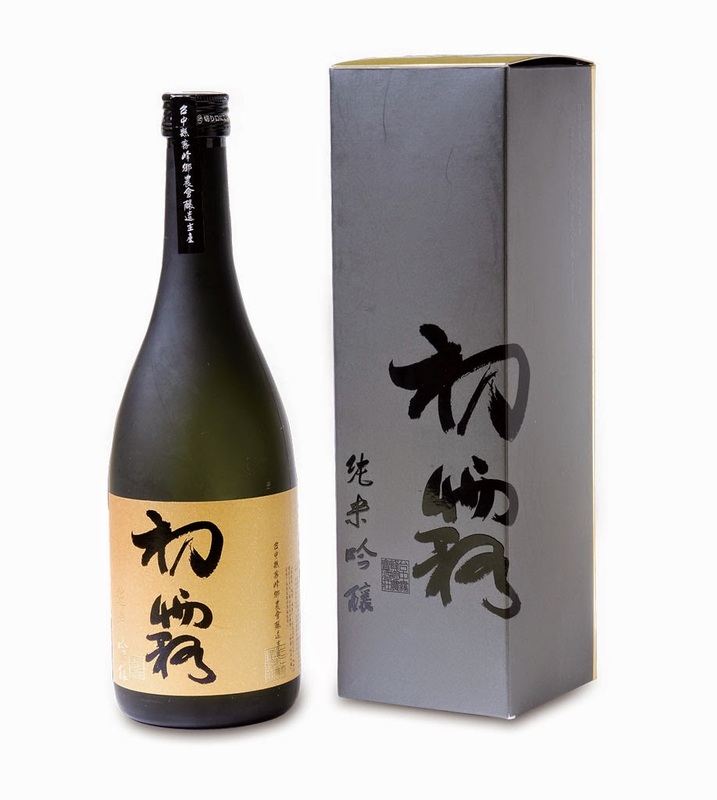 And in 2005, a distillery (霧峰農會酒莊) was planned and established in 2007 to also promote the saké brands. The principal ingredient is of course the rice, which must first go through stringent preparation processes in order to obtain the rice core. Each grain of rice is consisted of the outer cortex that contains protein and lipids, and the inner nucleus or core, which is rich in starch. Only the core, 60% of the total weight, is suitable for wine-making (the removed cortex is used for making rice crackers). After this polishing, rice-washing then ensues and with which, an additional 2% of the original weight is removed. Washing is done by using the clear and sweet spring water shipped in from Puli (埔里). Then the rice cores are soaked in the water and allowed to absorb 25-30% (w/w) at 10-15C. The excess is then quickly drained - done within a predetermined time. Then comes the most important step: Steam-cooking to ensure the rice cores are hard on the outside and soft on the inside. After a rapid cooling, the cores are divided into 5 equal parts, and one of which saved as the first batch of the wine-starter rice (酒母米) and another for koji (麴) preparation. Koji is made in a special room at 30-42C; from 220Kg of the original steamed rice cores, only 70 grams of koji can be made, which is then divided into 4 equal parts with one dedicated for making the wine-starter (酒母, literally the mother of wine). By mixing koji酒母, water, and wine-starter rice together with yeast and Lactobacillus, the fermentation process starts to break the starch down to glucose residues and from the latter, ethanol is generated. This step takes about 20-25 days or when the foaming from carbon dioxide formation stops. The mixture will now contain about 20% alcohol. This final mix is loaded into cloth-sacs and hydraulically pressed to release the liquid, known as the new wine (新酒), which is further filtered and sterilized (at 65C) to eliminate impurities and residual yeast and bacillus, respectively. The newly formed saké is stored at 15-20C for 2-6 weeks so it'll reach maturity. And after another filtration come blending, bottling, and the final packaging. The Distillery has been very active in its R&D. Not only saké, recently minted liqueur and fruit wines by the Distillery have also begun receiving international accolades. Among the many awards, 純米吟釀 has received silver medals at Vinalies Internationales in Paris (2011 and 2015), gold/silver medals for 燒酎 at the International Spirits Award in Germany (2011 and 2012) and a gold medal for 荔枝蜂蜜酒 from Concours Mondial de Bruxelles in Brazil (2014). 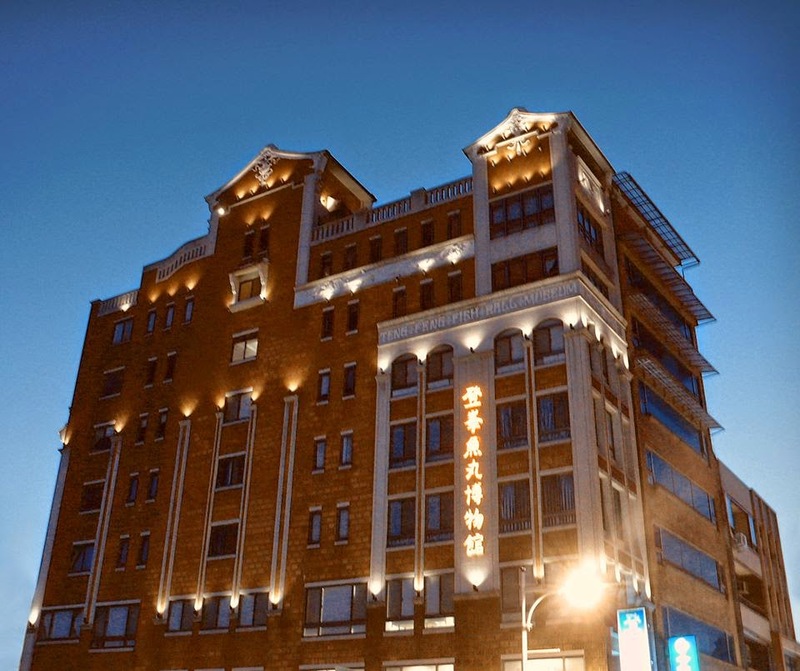 For more on wine selection, contacts, location and direction to 霧峰農會酒莊, click here. During the Qing era, migrants from Hokkien brought with them the 秈稻, commonly known as Zhailai rice (在來米) to Taiwan. In 1752, it was discovered that rice cultivated in Pintung area could yield crops twice a year. This strain was then widely distributed. And the resulting increase in output had turned Taiwan into a major rice supplier to the Hokkien homeland. There were numerous different Zhailai sub-strains with varying qualities, however. Also, Zhailai was deemed unacceptable to the Japanese who generally preferred their own sticky short-grained 稉米. Therefore, starting in 1900, the Japanese Colonial Gov't ordered experimentation of rice breeding, importing 1,256 strains from Japan and settling on 752, represented by the Nakamura中村 strain, to be inter-bred with 236 Zhailai strains. By 1906, the purification and improvement of Zhailai were largely complete, with nothing to show for the Japanese needs, however. ［Note: The most notable strains were 臺北101號, 苗栗2號, and 臺中35號, among the more than 100 newly developed cultivars.］Worse, the cultivation of the Japanese strains was met with repeated failure. 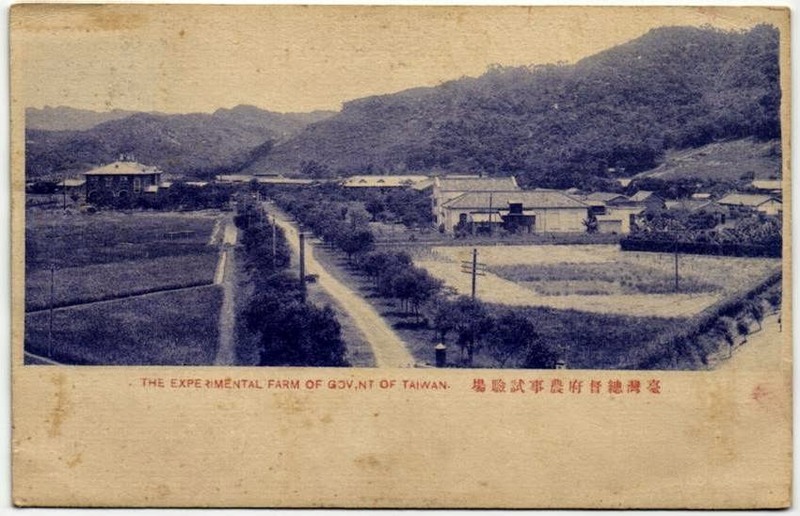 In 1921, the director of agricultural affairs of Taipei Prefecture 平澤 龜一郎 found that the 草山 (now Yang Ming Shan) 竹子湖 area was similar in weather to Kyushu and proposed that Japanese rice cultivars be empirically planted here to improve the odds of survival (see photo below). Cross-breeding of Japanese strains had actually started in 1922 at Taichung Agricultural Experimental Station, going somewhat against the gov'tal orders of improving Zhailai strains for Japanese use first. And in 1924, it was finally successfully done between 龜治 and 神力 strains by Mr 末永 仁, under the direction of Prof 磯 永吉. 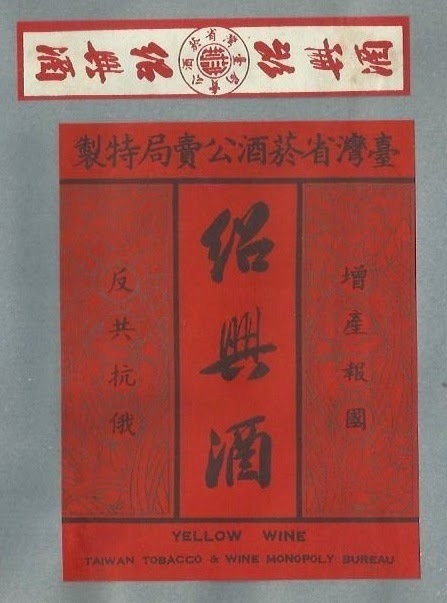 In 1925, the Gov't relaxed its Zhailai first policy. So in 1929, the most promising hybrid 臺中65號 was selected and planted in Yang Ming Shan under a shortened germination schedule (幼苗揷植法). Surprisingly, it also readily adapted to the warmer weather in southern Taiwan where the farmers began cultivation, thus quickly replacing the lesser 嘉義晚2號 (found in 1926 from the 伊予仙石 strain). 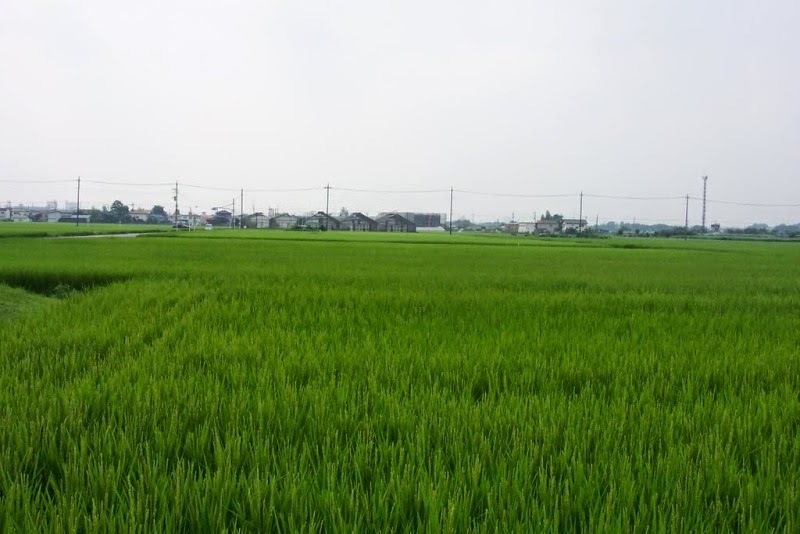 Together with another disease-resistant Nakamura-Zhalai strain the 高雄10號, these two eventually became the most widely planted rice crops. The twice a year harvests proved not only enough for consumption in Taiwan but also for export to Japanese mainland. 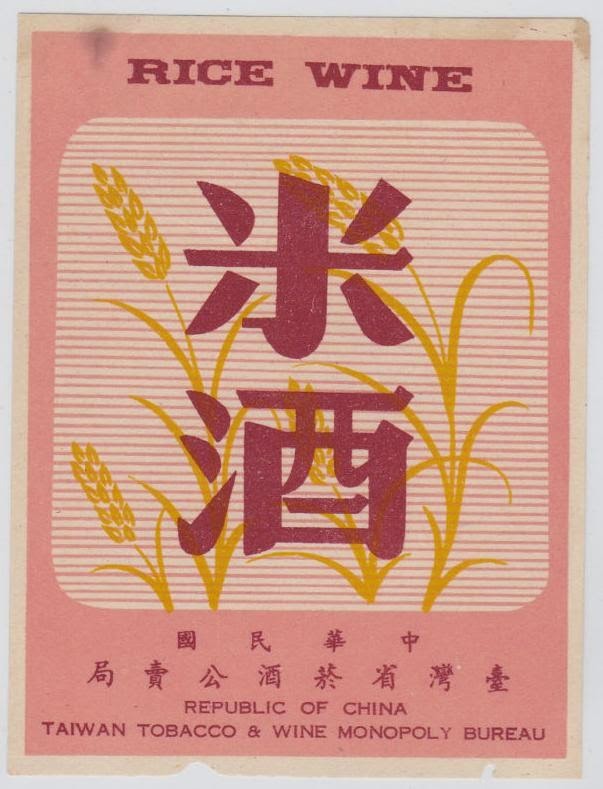 The name Penglai Rice (蓬萊米) was coined in 1926 by Prof 磯 at a national rice and grain conference in Taipei. 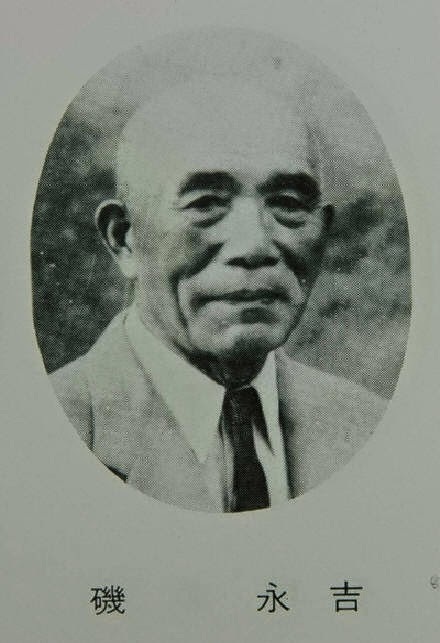 He was one of the few Japanese invited to stay after the war who finally retired from National Taiwan University and returned to Japan in 1957, after serving Taiwan for 47 years. 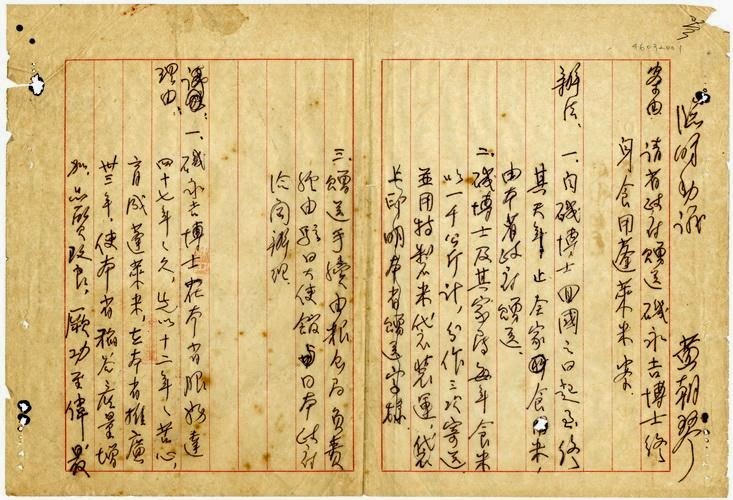 In gratitude, Taiwan Provincial Council voted to send him and his family 1,000Kg of Penglai rice every year as a life-long pension (see the original draft below). Prof 磯 passed at age 86, two years short of his personal wish of 88 (88 in kanji is 八十八, the 6 strokes of 米 rice), a humble man who had always attributed the success of Penglai to his co-workers and the cooperating farmers, but never himself. The cross-breeding success between 龜治 and 神力 strains that finally yielded the revolutionary 臺中65號 remains a mystery, since both parental strains were sensitive to the seasonal change in daylight duration, but not the offspring. As it turns out that an extra segment of DNA of 1,901 bases was somehow incorporated into the genome of 臺中65號 rendering it insensitive to the sunlight duration. This is most crucial to the twice yearly planting/harvests in Taiwan. The source of this DNA segment has only recently been identified and traced to the aboriginal dry-land rice strain. Apparently, its DNA segment had somehow "contaminated" the initial 6 generations of 臺中65號 breeding. Inadvertently through cross pollination? No, not under the meticulous care of Mr 末永. Genetic introgression? Perhaps, but how? Most definitely, an angel who happened to be passing by had done it in answer to the rice-children's plead for help for their beloved and overworked parent, Mr 末永. This, we the people of Taiwan have absolutely no doubt. Instead of "how are you?" the Taiwanese greet one another with “吃飽未 (pronounced jia-ba-ve)?” which in Singapore becomes "have you eaten yet?" - thus suggesting a common Hokkien origin. This unique greeting can be interpreted as an obsession with food; although more to do with rice, the indispensable filler, taken 3 times a day with or even without side-dishes. Indeed, who wouldn't equate a full stomach with well-being. Successful harvests of the rice crop are of the utmost importance throughout Chinese history. Shortages were rarely tolerated by the populace and famines often led to riots, revolts and dynasty changes. Improvement in the yield, disease resistance, and quality of rice is therefore a state responsibility in modern times, actively pursued by very dedicated folks who often regard developing seedlings as their own children. These researchers are sometimes aided by angels passing by (路過的天使) in discovering a revolutionary new strain. Indeed, breeding a new rice strain is an extremely laborious process that requires a lot of hard work (and sometimes luck). In the 1920s, the Japanese Central Gov't decreed that mainland Japan was to develop industry, and its colony Taiwan, agriculture. The initial emphasis was on sugarcane to alleviate sugar shortage in Japan. Rice quickly became a runner up, however. Eventually how much land was to be allotted to each crop became a hot issue that could only be resolved by increasing the crop output. Plus, the rice must be of the quality that could be sold in the Japanese market. As to exactly what are involved in the R&D process, a recent case in Hokkaido can shed some light. 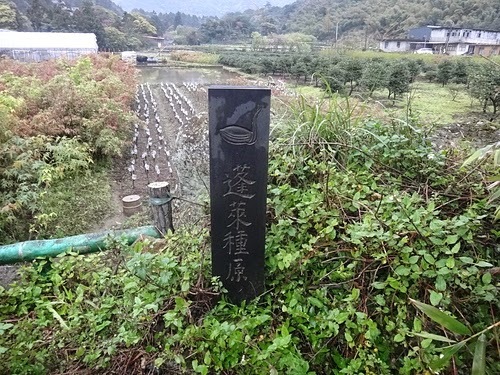 In 1980, researchers at Kamikawa上川 Agricultural Experiment Station set out to develop a new strain of rice that was to be competitive with the best from Honshū, i.e., Koshihikariコシヒカリ越光 and Sasanishikiササニシキ笹錦. This was a tall order because Hokkaido was too cold for southern rice strains and the native strains were known to be of such a poor quality that "even birds won't touch". "...about 100 varieties are crossbred each year, and 150,000 to 200,000 offspring are produced. For the first three or four years, succeeding generations are raised to establish the desired characteristics. Tests are performed on flavor, cold and disease resistance, and yield, and the most promising hybrids are chosen. 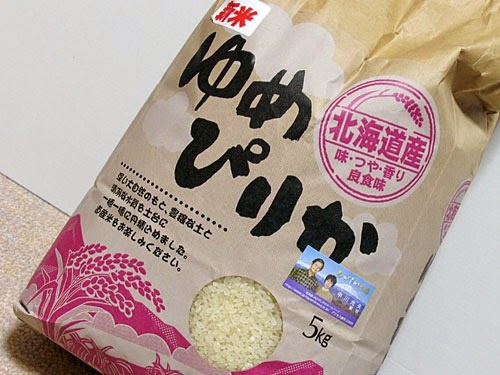 Following this, farmers grow a test crop..."
The test hybrids were then compared with Nanatsuboshi七星 rice, grown at the Kamikawa station, and graded according to whiteness, luster, aroma, texture, flavor, stickiness, softness, and overall quality. Success finally came in 2012, in the form of Yumepirika ゆめぴりか (i.e., the 上育453 strain) which is a combination of the Japanese word for dream (yume) and that for beautiful (pirika) in the language of Ainu (Hokkaido aborigines). So now, Yumepirika is a well-known name brand (above), sold all over Japan. In Taiwan, the R&D was on a much grander scale (see Part 2). 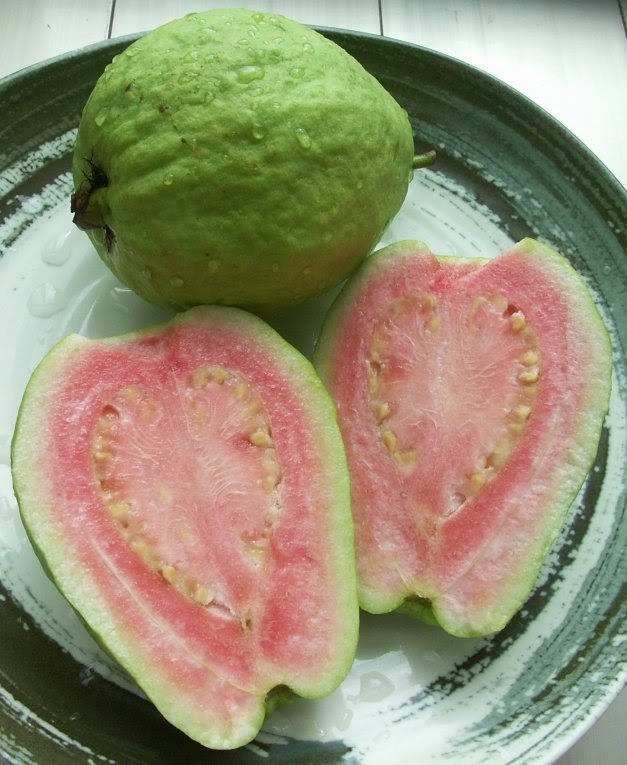 The history of guava in Taiwan is fairly simple, it was introduced from China in 1694. Its Chinese name is 番石榴 (savage pomegranate). Taiwanese called it 林菝仔(Na-bu-la). Southern Taiwanese dialect puts it as Bala (might have been Portuguese as pointed out by Katy Biggs), and further reverse-translated into Chinese, 芭樂 (Ba-le). 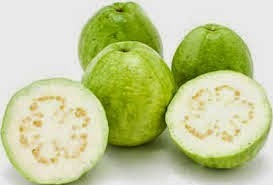 Guava is grown in Southern Taiwan in about 6,000 hectares of groves and available year round. Leading in production is 燕巢鄉Swallow's Nest Village in Kaohsiung. Wild ones can be found everywhere in Taiwan, with the fruit the size of a Tankan, still quite edible. Interestingly, the seed-embedded core of guava refuses to be processed in children's small intestines, so the fruit was generally avoided by knowledgeable kids (expert opinions to the contrary notwithstanding). 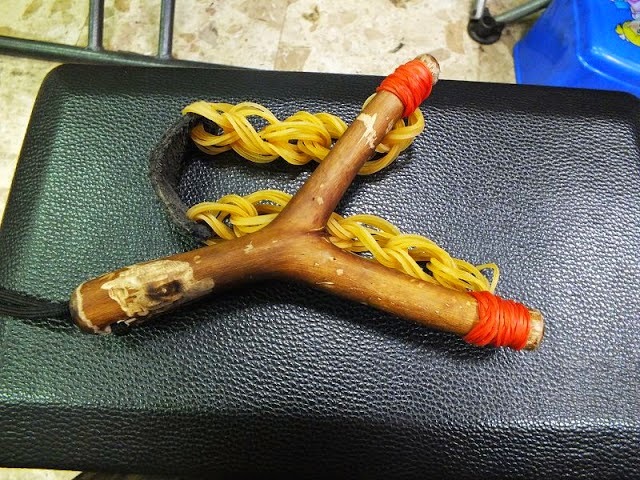 A good alternative use of guava is to turn the perfectly Y-shaped hard-as-steel guava branches into slingshots. Rubber strips cut from the inner tube of a bicycle tire works better than rubber bands (above). Sparrow-hunting with slingshots was a national past time for children in the 50s. Factoids: (1) Guava and tomatoes are both banned as offerings to the gods/spirits, because the seeds cannot be digested that might displease those being honored. (2) 芭樂票 refers to a bad check, a kite or a dud, an inevitably bounced check. The success of the world-renowned food tourism in Taiwan has been attributed to the import of dishes from Japan and China in the past, and more recently, from SE Asia. While it is true that outside contribution has enriched the food culture, a recent postulation, that Taiwan never had developed its own and that the colonization of Taiwan was therefore in part via cooking, truly deserved a closer look. It is an interesting angle, for it argues for deliberate suppression of Taiwanese identity, when in fact, it may border on over-reading of the past. From which, we know that except 魚生 might resemble 刺身sashimi, no Japanese dishes were included in these extensive menus. Japanese cuisine, kaiseki or otherwise, was largely confined to Japanese restaurants, even now. It can be argued that the menu dishes shown above were pan-Chinese in origin. Indeed most are still recognizable, some even indistinguishable from those from China. The only difference is that delicacies such as pheasants, shark's fin, pigeons, horse meat, and some fishes are now disappearing or gone. But this is a minor point. Because they were not part of the Taiwanese cuisine anyway. Taiwan's own was rooted in Hokkien of the 1700s [which can still be found in Malaysia and Singapore now], modified necessarily to fully utilize local agricultural products. Whether this is still regarded as Chinese is akin to arguing pizza served in the North End in Boston is Napoli. Did the Japanese invent Taiwanese cuisine for Taiwan? The Goto Shinpei Administration (1898-1906) had adopted a "leave the natives be" policy as far as the societal and cultural aspects. The 1903 Osaka National Industrial Exhibition featuring produces from Taiwan was intended as a showcase of fruits of the 1895 victory, and sample dishes prepared by Taiwanese chefs onsite were in name only, still Chinese. In fact, the theme of the display was Taiwan as part of China that had prospered under the colonial rule - despite the still prevalent foot-binding and opium abuse. With the all-out efforts, the Taiwan exhibition had nevertheless failed miserably, unable to generate much interest from mainland Japanese or change the latter's view of Taiwan as a land of barbarism and diseases. So much for the invented "Taiwanese" cuisine indeed. [Note: This mainland snub had infuriated the Japanese ruling bureaucrats, the young descendants of samurais from the Northeast, who would later become closely identified with Taiwan.] Essentially, the restaurant scene in Taiwan had continued on unmolested, in establishments such as 江山樓 and 蓬萊閣 both in Taipei. These were usually frequented by Taiwanese gentry, the upper class. The true Taiwanese culinary identity is hiding in plain sight, on display as the often derided as being "土earthy" food preparations. 土 is in the sense of being inferior and provincial, a word uttered mostly by the Chinese elite. Most non-Taiwanese would not have sampled (or cared to even try) the uniquely Taiwanese dishes such as pig lungs simmered with pineapple chunks, shark's fin stewed with marble pork and bamboo shoots (this is not the starchy soup served in restaurants today), or whole Ming shrimps served with mayonnaise, etc. Known for being simple and light (as opposed to heavily flavored), the main course often includes boiled chicken and pig liver, no special skills needed, except that the food is to be enjoyed with especially prepared sauces, which in effect define the individual dishes. 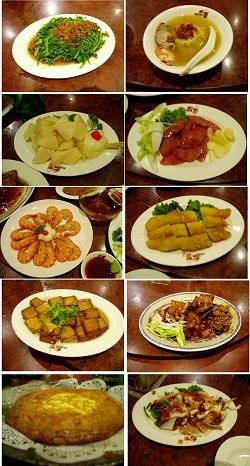 These dishes and sauces are not readily available as they are more commonly served in outdoor banquets, i.e., in the hosted 辦桌 (table management) parties overseen by famous chefs known as 總鋪師. 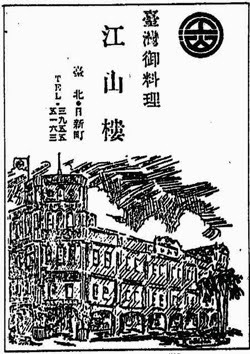 Invitations to these special occasions were not usually extended to non-Taiwanese in the old days, Japanese and Chinese alike. Missing-out bred ignorance, followed by contempt abetted by conqueror's superiority complex. The menus, however, have always been around, and some items occasionally show up in boutique eating places today. Were there deliberate attempts at obscuring Taiwanese culinary culture? Possible, but unlikely. Restaurant business is part of free enterprise and people vote with their taste buds. In fact, the 辦桌 beat always goes on despite multiple regime changes. Neglect from ignorance, more benign than malicious, is probably a more accurate description. Then again, Taiwan cuisine having been denigrated to be 土 and banished matter-of-factly into the peasant food category, it would have no hope of joining the ranks of the far more recognized 8 schools of Chinese cooking, so it has remained in the shadows but not forgotten. Although, to casual outside observers, it would seem to have never existed, ever. A systematically organized, well-written book on Taiwanese cuisine will certainly set the record straight. First things first: It is Water Apple, not Wax Apple! 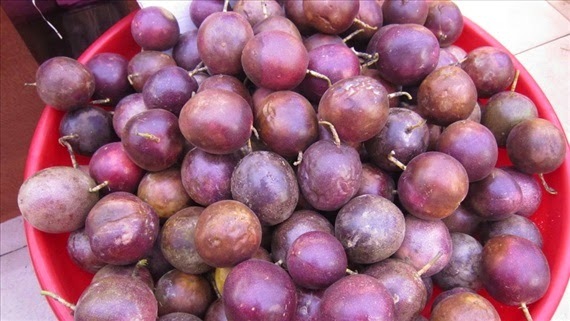 蓮霧LianWu has many different names in English, e.g., love fruit, wax apple, bell fruit, rose apple, and water apple. In Taiwan, the term "wax apple" seems to fully occupy the web literature, apparently the posters never realize that "wax" can be a bit unappetizing, as natural wax, such as carnauba or shellac, is often applied to the surface of apples for preservation during shipment, and these are called "waxed" apples. In contrast, "water apple" accurately describes the fruit, the waxy looking exterior is really irrelevant. The poetic Chinese name of 蓮霧lotus mist also originated in Malay [from "jambu"]; Malay Peninsula was where water apples, called "Jambu Air or 水蓊water guava" came from. 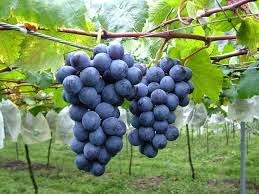 The proper name in Chinese should be 蒲桃 [also the ancient name of Java], discarded because it pronounced the same as the grapes. In all cases, water is in the name, never wax. A common sight in wet markets. It is generally agreed that the Dutch had brought water apples into Taiwan from Java in the 17th century. No disputes here. In 2006, the cultivation acreage was 7,030 hectares (down from a peak of 10,502 in 1987), mainly in Pintung (5,715 hectares). 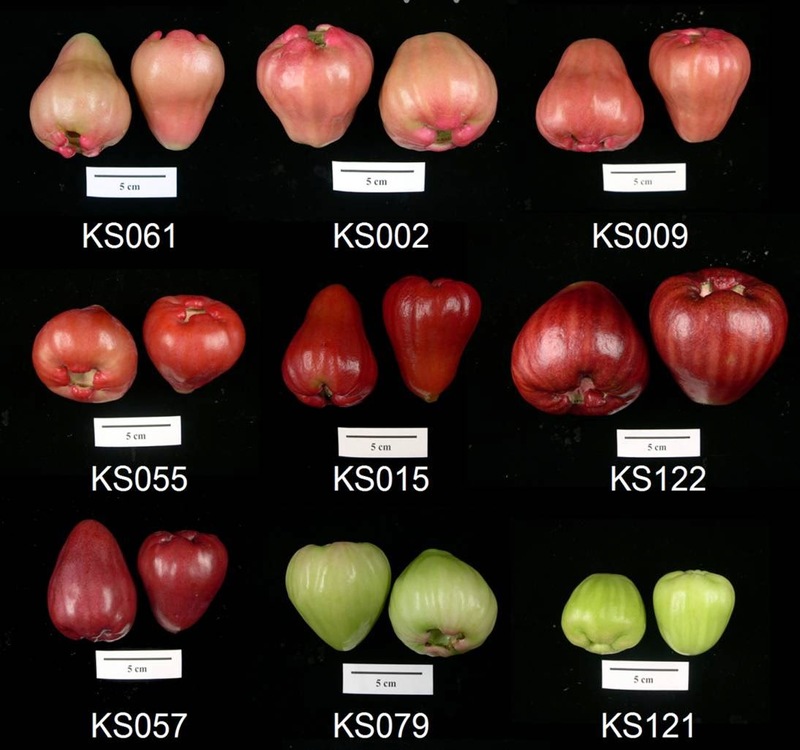 The pink Nanyang variety still dominates (70%), other colors with various shapes and sizes are from recent R&D efforts of the horticultural experts in Taiwan. They have bred strains imported from SE Asia with that grown natively in Taiwan. Among them, the most successful were the "Black" series, i.e., Black Diamond and Black Kingkong. These were derived from the Black Pearl, discovered in 1967 by accident. When fish farmers in 林邊鄉LinBian Village in Pintung re-appropriated their land rich in extra-salty ground water for agricultural use, they found that the pink strain bore ultra-delicious dark red fruits. These Black-series water apples are priced higher than the more common pink strain. And in 2000, Thub Thim Chan (or Thong Sam Se, i.e., Red Gem紅寶石) from Thailand was also re-planted successfully in Taiwan. 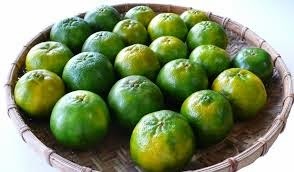 Because of the large size, juicy content and enticing color, this fruit is becoming popular now. Of course, the rich water content also shortens the shelf life of water apples. 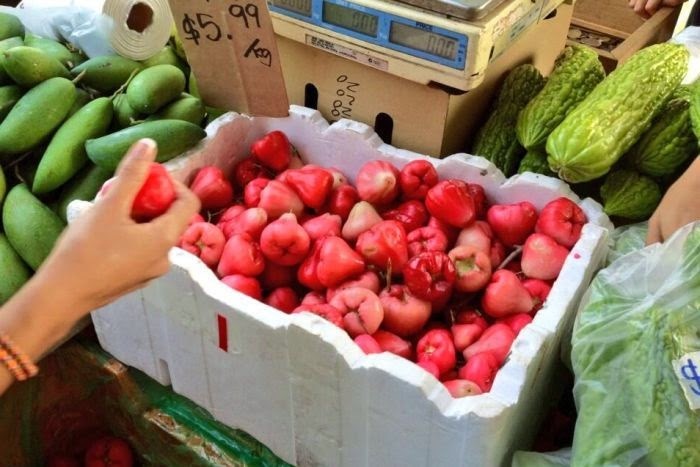 Luckily, fresh water apples are now available year round thanks to the breeding successes. There have always been Aboriginal families residing in Tamsui Township and the Greater Tamsui area. The total population has remained no more than a few hundred, from since the Spanish-Dutch period in the early to mid-1600s up until 1980 when influx of the Aborigines from outside of Tamsui began. The oft-repeated, politically-charged issues of Aboriginal-Han intermarriages, Aboriginal assimilation into Han, Aboriginal blood lines in Hoklo, and grabbing of Aboriginal land by the Han-Taiwanese ring pretty hollow as far as this part of Taiwan is concerned. Through the efforts of Taiwanese/Tamsui historians, we now know much more, far more than that reported by the occasional visiting scholars from outside of Taiwan. It can be seen that by 1655, a total of 119 families with 435 individuals resided in these Tamsui districts. By 1935, total Pinpu families numbered more than 44 with 202 individuals, far fewer than the 26,095 total non-Aboriginal population in the Greater Tamsui area. It is clear that the Aboriginal population size may ebb and flow, all were always tied to their own land. Newcomers are also readily identified. 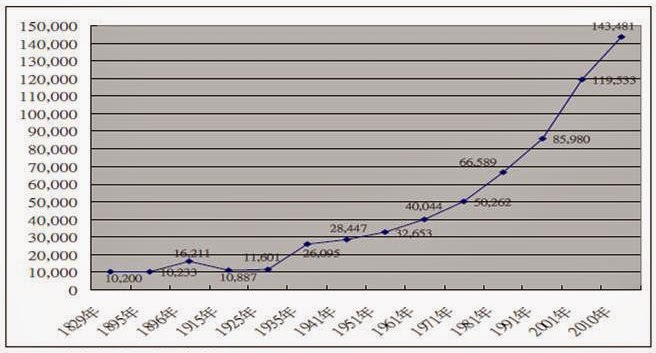 According to 淡水戶政事務所Tamsui Household Registry Office, the registered residential Aboriginal population in Tamsui Township itself (excluding outlaying villages) increased from the original locals of 13 in 1976 to 70 in 1980, then to 397 in 1990, 820 in 2000, and 1,451 in 2010. 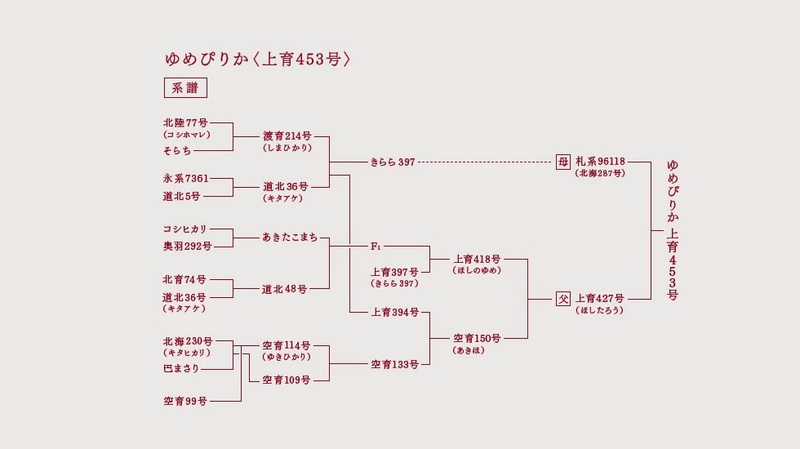 They are mostly 阿美Amis (718), followed by 布農Bunun (265), 泰雅Atayal (156), 排灣Paiwan (109), 卑南Puyuma (21), 魯凱Rukai (12), 噶瑪蘭Kavalan (8), 賽夏Saisiat (6), 鄒Tsou and 邵Thao (3 each), others (63), and unknown (83). Also, male = 653 and female = 798. Since most of the first-generation Tamsui-lang arrived from Hokkien in mid- or late 1700s or even later (see here) when the sporadic migration bans loosened up, and many if not most arrived as husband and wife teams, a male Han marrying an Aboriginal bride was not impossible but pretty much unheard of. And land purchases from the Aborigines must go through proper legal proceedings (see, e.g., here). Did the Pinpu assimilate into the Han? Of course they did, although their tribal identities remain intact as evidenced by the number of households reported during official census-taking. In earlier times, especially during the early Qing rule under Ming-Cheng turncoat 施琅Shi-lang (1621-1696), the Pinpu had been severely maltreated (see, e.g., here). Despite recent efforts, there is, however, still no consensus on how the wrongs should be righted, by whom, and to what extent. Above all, the concept of collective guilt in addressing the Aboriginal grievances is non-existent, nor will it be accepted by the populace. Historically, managing Aboriginal affairs in Taiwan has been a total failure. This is not going to change anytime soon. The classification of oranges in the US and elsewhere is actually not that complex, essentially there are tangerines, oranges and their hybrids. But then, from which have spawned 600 some varieties world-wide according to one estimate. 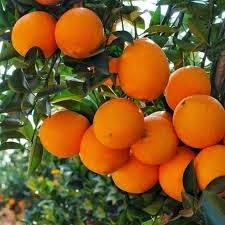 The most well-known are Valencia, Mandarin, Clementine, Navel, Moro, etc. Let's just say that orange growers seem far more obsessed with naming their fruits than other farmers. Similarly, there are only three main types of oranges in Taiwan, namely, 桶柑, 椪柑, and 柳丁. And again, street names of local sub-varieties are countless, everyone has a poetic license. 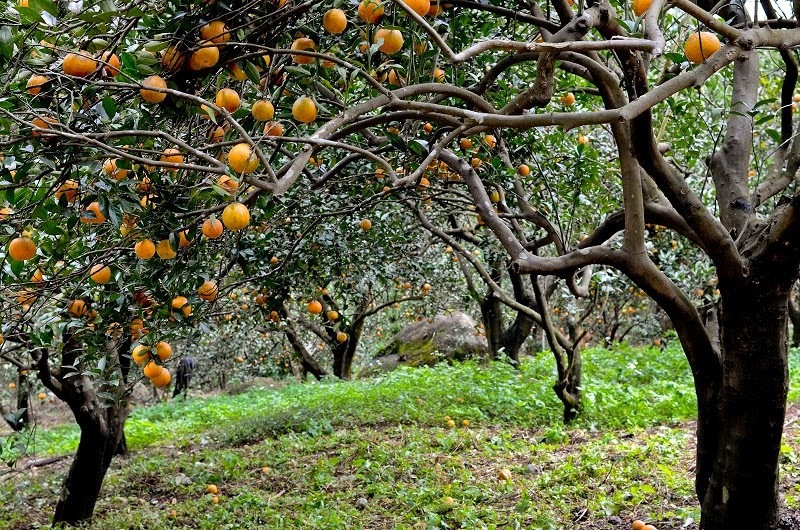 The most practical classification is straightforward, the Taiwanese do it by assessing how oranges are readied: easily peeled with fingers are 橘； need a knife to cut into wedges, 橙; and in-between or either way, 柑. Those of us from Tamsui are most familiar with 桶柑 (Tankan, bucket oranges) because it was widely grown in Yang Ming Shan ridges. It was first planted in Hsinchuang 新莊 having come from Teochew潮州 in 1789. The trees actually thrive in cooler climates in northern Taiwan and usually bear fruits, conveniently, around Lunar New Year. 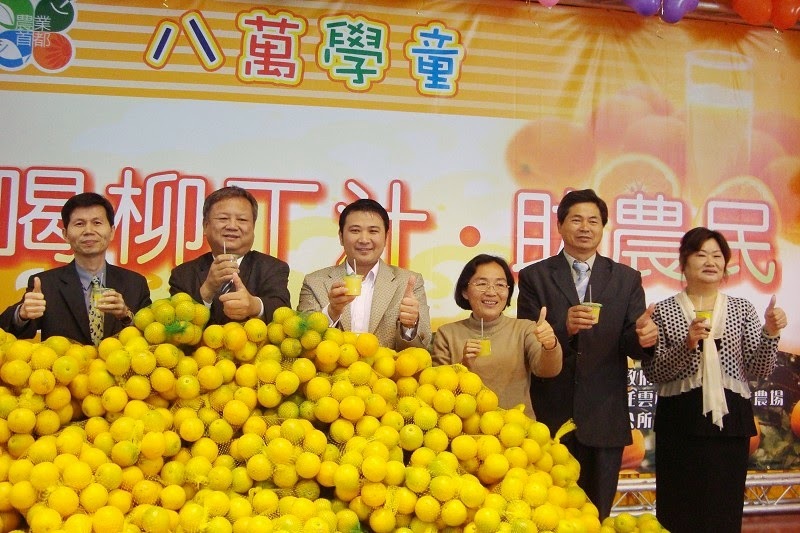 In 2011, the recorded planting areas in Taiwan were 3,277 hectares, yielding 54,739 tons of this fruit. The exact reason why they are called bucket oranges is uncertain. A commonly accepted version is that in the past, mid-sized wooden 桶buckets/barrels were used to store and transport the fruits from China to Taiwan. However, other than the transient function as containers, the intended purpose(s) of the buckets and why they were chosen are still anybody's guess. The loose-skinned 椪柑 (Ponkan) was originally from Poona (or Pune, hence the phonetic "椪") in western India, introduced into southern China during the Tang Dynasty (618–907 AD). It came to Taiwan in 1775, also landed in Hsinchuang first. [Note: Others claim that Ponkan arrived in Hsinchu in 1812, through the efforts of the Yang Family in Hsin-Pu. Unfortunately, the once robust trees were decimated by 黃龍病Huanglongbing* in 1953.] Also, some posit that the orange was from Suntara in middle India; although Suntara appears the name of an orange species from Dehli, Nagamore and Ceylon (see Emanuel Bonavia: The Cultivated Oranges and Lemons etc of India and Ceylon, WH Allen & Co, London, 1888). China remains the world's largest producer of Ponkan today. And Ponkan in Japan actually originated in Taiwan. It was introduced in 1896 into southern Kyushu prefectures, in Kagoshima, Miyazaki, and Kumamoto. The better-known varieties were 太田 and 興村, although now seem to be lumped together with Mikan (蜜柑). In 1987 in Taiwan, the cultivation area was 14,000 hectares producing 170,000 tons; however, in 2011, it was down to 6,096 hectares with 140,000 ton production. This decline seems to be still continuing although stabilizing at the same time, most likely a supply and demand adjustment. The tightly packed 柳橙 (Liuchen), 柳丁 (Liuding), or by an older name 廣柑 (Cantonese orange) was a relatively new comer, first introduced from Canton in the 1930s, but was not widely farmed until the 60s, mostly in the warm southern plains of Taiwan. Its original identity as the Xinhui新會 orange is now in doubt, as a DNA study has failed to give support. It may still share the same origin as the Xinhui of course. In 1988, the cultivation area was 16,265 hectares, producing 230,000 tons. This was a bit too much for the market to absorb, so the prices dropped like a stone, and the surplus was consumed mostly as fresh juice, dispensed of the costly packaging. In fact, freshly squeezed 柳丁 juice is still the orange juice of choice in Taiwan today. In 2011, the production decreased to 5,904 hectares and 170,000 tons, more in line with the demand. Factoids: (1) An orangy rumor has been going around for the longest time, in that “Sunkist” was actually from 辰溪 in Hunan Province, China, brought back to the US by missionaries about 100 years ago. And the evidence? Well, 辰溪 is pronounced almost the same as Sunkist, isn't it? Sunkist Co-op itself, however, maintains that theirs came from Brazil in 1870; 3 navel orange seedlings that got things started in Riverside, California (the etymological origin of Sunkist is, however, unclear). (2) The first known introduction of Ponkan into the US was in 1892 or 1893 when an American medical missionary in China sent fruits to JC Barrington of McMeekin, Florida, from which seedlings were grown. It now appears that (1) might have evolved from (2). *黃龍病Huanglongbing: A deadly bacterial infection that affected all types of oranges in Taiwan. This bacterium is hosted by 木蝨woodlouse, an insect that can be controlled by deploying its natural enemy, the 亮腹釉小蜂eulophid wasp, without the need for insecticides. 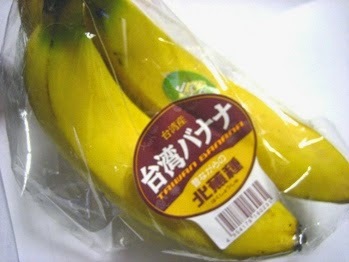 Taiwan has been an exporter of bananas, especially to Japan, since 1902. 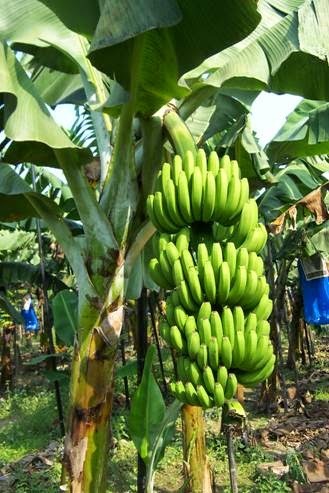 The golden era, however, truly started in 1963 when Japan instituted a quota-free banana import system, the banana enterprise in Taiwan reached its zenith in 1967 with more than 52,000 hectares of farmlands producing 653,800 tons of bananas. And of which, 394,966 tons were shipped to Japan directly, taking a 90% share of this market. Unfortunately, it was soon out-competed by bananas from the Philippines cultivated by multinational conglomerates from middle and south Americas. 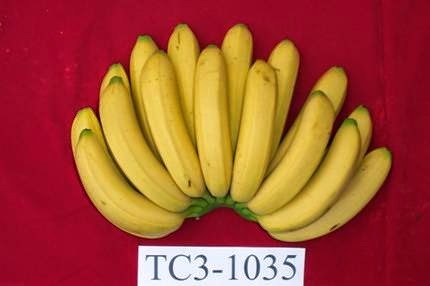 Within 10 years, Taiwan's banana business went into a free fall which was further exacerbated by scandals and mismanagement at the Taiwan Fresh Fruits Co-op, plus the untimely fungal blights that had also severely reduced the output. There have been no significant recoveries since, for example, in 2005, Taiwan's market share in Japan was down to a mere 3%. It remains a major fruit crop in Taiwan nonetheless. Which one(s), or even some of those yet to be developed, will survive in the long run is still being worked on, by very capable researchers no less. Rest be assured, though, that we will always have bananas to enjoy, as there are more than 300 strains of bananas on this earth. Cavendish is merely one of them, just happens to be the most popular one at present time. Factoids: (1) Banana 香蕉 is pronounced 芎蕉 in Taiwanese. 芎 is derived from 弓 as the "bow" in "bow and arrow". A banana shapes like a bow, hence the name 芎蕉. (2) A 香蕉芎 is a "hand of bananas" in English, and each banana is a "finger". 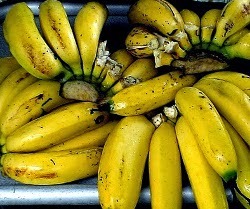 A "bunch" of bananas refers to, technically, the whole "six foot, seven foot, eight foot bunch" (Harry Belafonte - Day O). 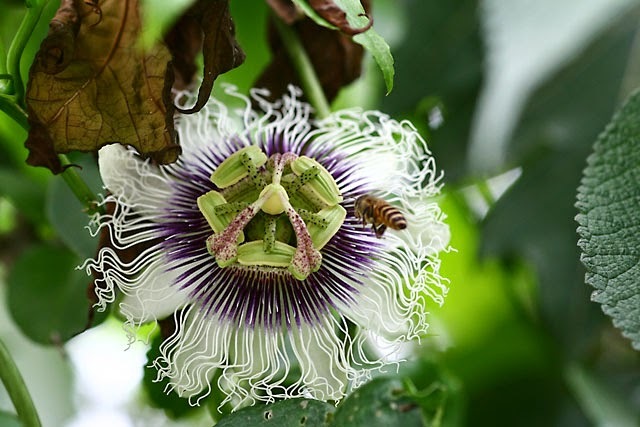 Passion fruit, so named, not because of some emotional attachments, rather it was because its flower looks like the crown of thorns worn by Jesus Christ and also the petals signified the 12 Disciples, i.e., it derived from the "Passion" of Jesus (according to Spanish priests who found the plant in S America in ca 1610). The Japanese, however, called the flower 時計草 (とけいそう) or clock-dial flower because of the resemblance. This is the dark purple type, never widely cultivated since the introduction into Taiwan and was left to grow on its own in mountain areas under 1,000 meters altitude, and grew wild it did, complete with various snakes sheltered under its shades. This fruit was once available in Tamsui, sold at roadside stands together with 彈珠汽水 (ラムネ, marble-sealed bottled soda) and other summertime treats. So called allegedly because its juice tastes like a combination of banana, pineapple, lemon, strawberry, star fruit, and guava, etc. Also, 百香BaiHsiang maybe a phonetic translation of "passion". 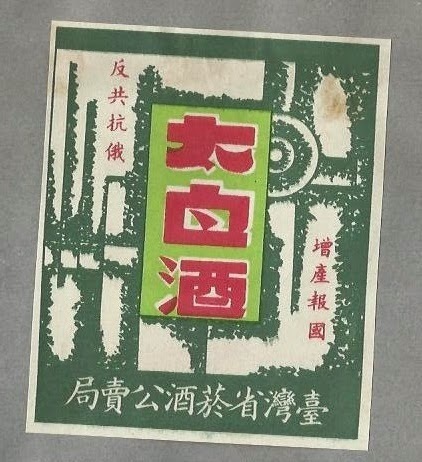 A more credible theory, however, is that in 1960, Taiwan Pineapple Corp started marketing canned passion fruit juice labeled 百香果汁, and the name stuck. (3) 西番蓮 is a botanical classification term. And 西番果 is used in China and Hongkong. 西番 means Western Savages. In 1964, yellow-skinned passion fruit cultivars were imported from the Pan-Pacific Farms in Hawaii, and in 1967, even more from S America. They were harvested mostly for juice extraction. The juice was then sold back to the US to be canned and distributed to its military (according to one report). 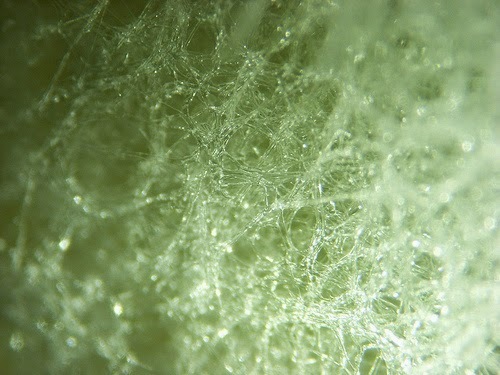 The yellow strain is not cold-tolerant that must be grown under 500 meters altitude. 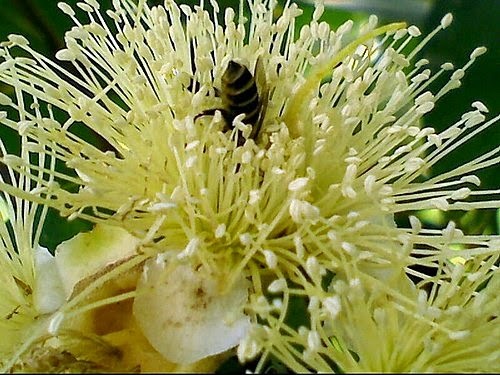 Also, time-consuming artificial pollination must be done to achieve fruition. 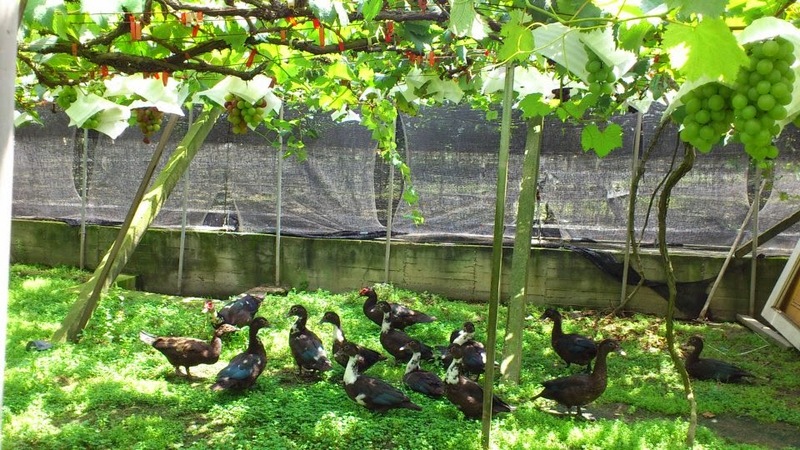 At present, the cultivation area is only about 200 hectares scattered in Nantou and Hualien areas, and because of a viral plight, it is necessary to re-plant the vines every year. Unlike the ubiquitous banana, watermelon and pineapple, passion fruits are still there in Taiwan, just have to search a bit harder for them. Grapes had never hit it big in Taiwan in the past. For years, private wine-making including that with grapes, was against the monopoly law which carried severe penalties. Native grapes were also tiny and sour, unfit for table use. No grapes, no problems, other fruits abounded anyway. These have all changed in the 1960s. 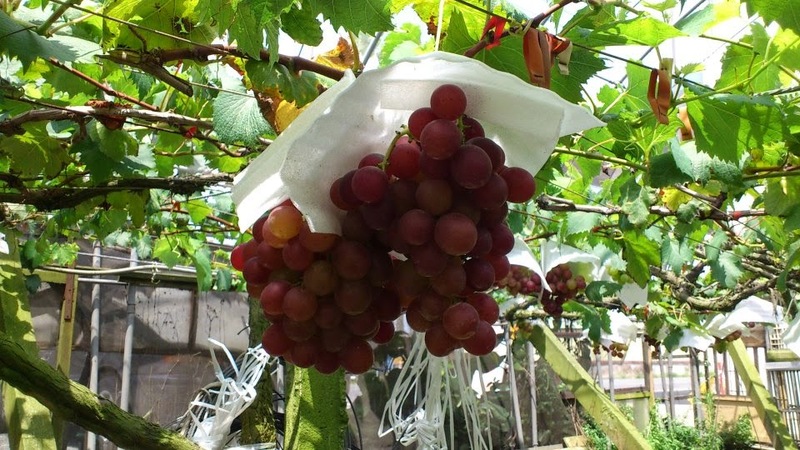 Since then, we have 巨峰 (Kyoho or ChuFeng), 義大利 (ltalia), 金香 (Golden Muscat), and 蜜紅 (Honey Red) varieties, among them, the huge, juicy and sweet Kyoho is arguably the most abundant and the best-tasting table grapes all around. Kyoho was first developed in Japan in 1935, a cross between the native Ishihara-wase and the Centennial from Australia. The exact date of its introduction into Taiwan is unclear; although 2 of the first 6 seedlings planted in 1964 in Changhua 大村Da-chun by Mr 賴炳芳 have survived to this day, and in fact are still going strong. Kyoho is cultivated mainly in Changhua, Taichung and Nantou, totaling 3,000 hectares. It is harvested twice yearly, in contrast to only once a year in its native Japan. Not only the soil and weather conditions are both right, the credits should also go to the skilled Taiwanese grape farmers for their careful pruning, fertilizing and nurturing of the plants. And of course, consumers do appreciate a good thing when they see one, and the demand has skyrocketed. 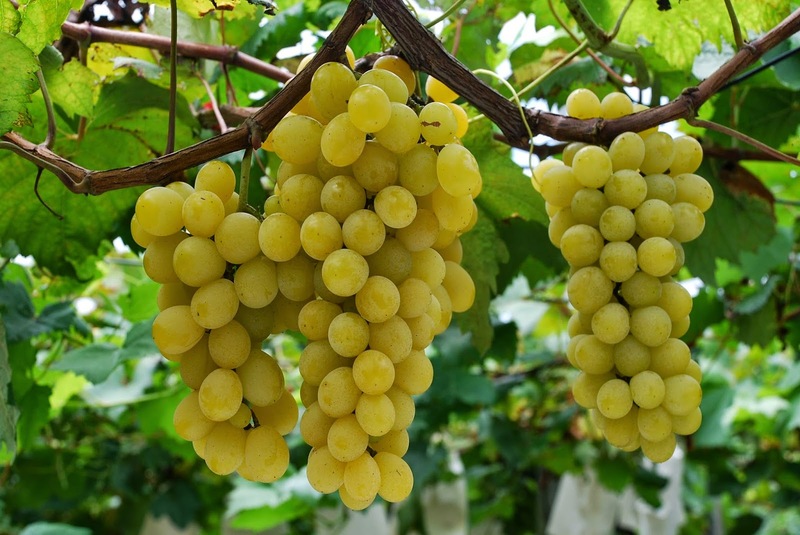 Curiously, China, known for hundreds of different types of grapes available from Xinjiang (grown in 吐鲁番Turpan area on the Silk Road), also started growing Japanese Kyoho in 1959. It remains somewhat murky as to how the cultivars were procured. We do know that starting in 1996 or a bit later, Taiwanese merchants brought the Taiwanese strain to Hainan and the transplant proved a huge success. Their Kyoho is now in direct market competition with Taiwan. 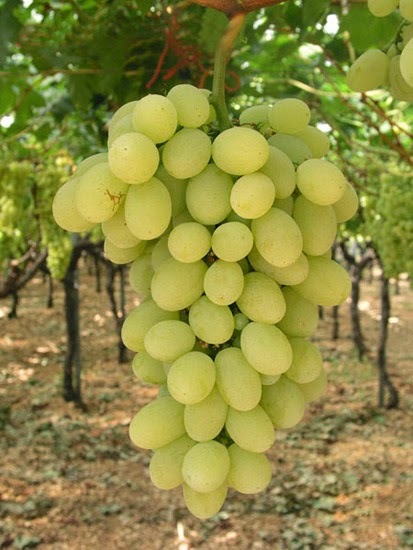 To order your own shipment of Kyoho grapes, go to this site (here) and for the Honey Red, here.